Adam J. Silverstein is Associate Professor of Middle Eastern History at Bar Ilan University. He held a British Academy post-doctoral fellowship at the University of Cambridge, before taking up lectureships in Near and Middle Eastern Studies at the University of Oxford, where he was also a Fellow of Queen’s College. Subsequently, Professor Silverstein was Reader in Abrahamic Religions at King’s College London. His publications include The Oxford Handbook of the Abrahamic Religions (2015) and Islamic History : A Very Short Introduction (2010). He is also the series editor for The Oxford Studies in the Abrahamic Religions with Guy G. Stroumsa. 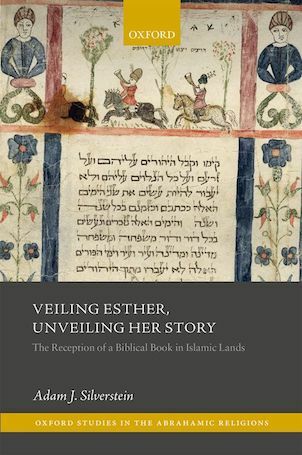 Veiling Esther, Unveiling Her Story : The Reception of a Biblical Book in Islamic Lands examines the ways in which the Biblical Book of Esther was read, understood, and used in Muslim lands, from ancient to modern times. It focuses on case studies covering works from various periods and regions of the Muslim world, including the Qur’an, pre-modern historical chronicles and literary works, the writings of a nineteenth-century Shia feminist, a twentieth-century Iranian encyclopaedia, and others. These case studies demonstrate that Muslim sources contain valuable materials on Esther, which shed light both on the Esther story itself and on the Muslim peoples and cultures that received it. Adam J. Silverstein argues that Muslim sources preserve important pre-Islamic materials on Esther that have not survived elsewhere, some of which offer answers to ancient questions about Esther, such as the meaning of Haman’s epithet in the Greek versions of the story, the reason why Mordecai refused to prostrate before Haman, and the literary context of the ’plot of the eunuchs’ to kill the Persian king. Throughout the book, Silverstein shows how each author’s cultural and religious background influenced his or her understanding and retelling of the Esther story. In particular, he highlights that Persian Muslims (and Jews) were often forced to reconcile or choose between the conflicting historical narratives provided by their religious and cultural heritages respectively. 7 : Why Did Mordecai Refuse to Bow ?